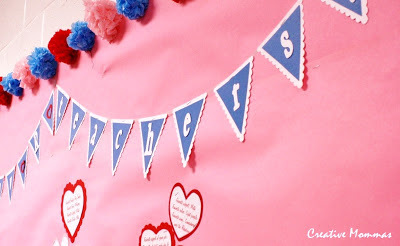 When I was thinking of ideas for the school bulletin board this month, I knew I wanted to do tissue pom poms somehow. So I made a boarder out of small tissue pom poms. The other thing I really wanted to do was make a cute pennant banner. I made this banner using my Cricut and SCAL. Beyond that I wasn't sure what I wanted to do with the bulletin board. I knew the theme had to be Valentines, so the thought came to me to create mailboxes just like kids create in class to receive Valentine treats from one another. This is the final product, minus pictures the teachers still have to get to me. I added the teacher's names to each mailbox and then spotlight information on each heart. I think it turned out pretty cute & just like always the pictures aren't the best. You've done a great job! You are really creative! Seriously cute!! My favorite so far. Great job. that turned out great! Love the pics too! Good job! So adorable!! I need a bulletin board idea with Steps (as in feet, not stairs)...I am going to check out your other ideas!